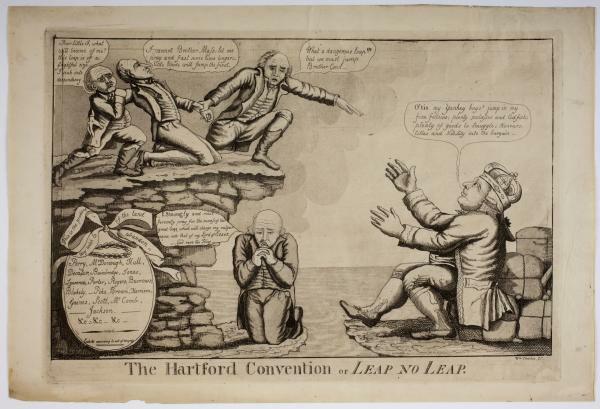 Crouching in the center of the print is Timothy Pickering, a leading Massachusetts Federalist who was strongly in favor of the Hartford Convention. Rhode Island (top left): “Poor little I, what will become of me? This leap is of a frightful, size - I sink into despondency –"
Massachusetts (top right): “What a dangerous leap!!! but we must jump Brother Conn –"
King George III (bottom right): “O’tis my Yankey boys! jump in my fine fellows; plenty molasses and Codfish; plenty of goods to Smuggle; Honours, titles and Nobility into the bargain –"
Memorial on cliff base (ribbon): “This is the produce of the land they wish to abandon –"